Look for places around your home where the pipes are most likely to freeze. This means any pipes that run through exterior walls, the basement, the attic, or the foundation. Because they are more exposed to the elements, these problem areas are almost always the first pipes to freeze and burst. Knowing which pipes are vulnerable is the first step towards preventing future damage. Some of the best methods of preventing frozen pipes are also the least expensive. Insulating pipe sleeves can be used to cover at-risk pipes, with heat tape serving as another alternative for smaller pipes or pipes in confined spaces. In a pinch, even bath towels and duct tape can be used to provide a bit of extra insulation against the cold. 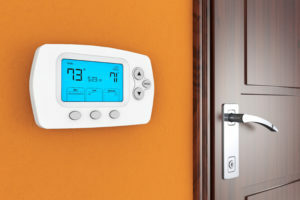 If you have a programmable thermostat, consider setting it so that the indoor temperature remains the same overnight. Since outdoor temperatures can dip dramatically when the sun goes down, turning on the heat can reduce the risk of waking up to a burst pipe. If you are facing down a cold front or the prospect of a snap freeze, it’s vital that you leave your faucets dripping both day and night. 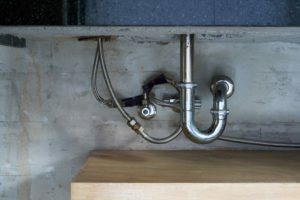 Even the smallest water flow is usually enough to prevent pipes from bursting, especially if the pipes are insulated. Turning on the faucets can also help you determine whether all of your pipes are at risk, or if only certain ones seem to be experiencing problems. take action before the pipe bursts by applying heat to it. Soak a towel in hot water and drape it over the pipe, or use a hairdryer to melt ice from the outside. Space heaters can be used if the pipe is an open area away from any flammable materials, but never apply sources of direct flame such as blowtorches or kerosene lamps. In some cases, you may simply be unable to deal with the problem on your own. If you can’t locate the pipe, or if it is in an inaccessible area, consider calling a local licensed plumber to resolve the issue. Keep in mind that paying for professional help costs much less than dealing with a burst pipe. Being prepared and informed is the absolute best way to avoid the hassle of dealing with burst pipes in the winter. 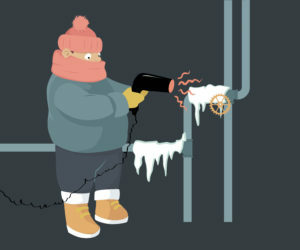 By using the tips and techniques above, anyone can prevent their pipes from freezing or have the knowledge necessary to thaw them out if they do. ]In the event of an emergency, or burst pipe, and you are unable to get water to your home shut off, have your utility company number readily available. They will rush an emergency crew out to turn water off to your home. We recommend placing your water utility company number on your refrigerator, or somewhere you will find it quickly in the event of an emergency. Do Homes Sell in Winter?